Little Black Ants in Your Kitchen - Yes Pest Pros, Inc. Little Black Ants in Your Kitchen - Yes Pest Pros, Inc. Most of the time people never see little black ants, more commonly known as sugar ants, actually coming into their house. Instead, they see the ants already inside, marching along in a line or moving back and forth from a piece of food left out on the counter, or a miniscule crumb or missed spill spot. The little black ants are in your house for food, and now that they’ve found it it’s going to be hard to get them to leave. What makes dealing with these ants difficult is that you can kill all the ants inside your home, but there are still hundreds of ants living in a colony outside of your home, or at least in a location you cannot get to or, more likely, cannot find. This means that the worker ants you kill don’t matter much in the big picture because more worker ants will eventually arrive. 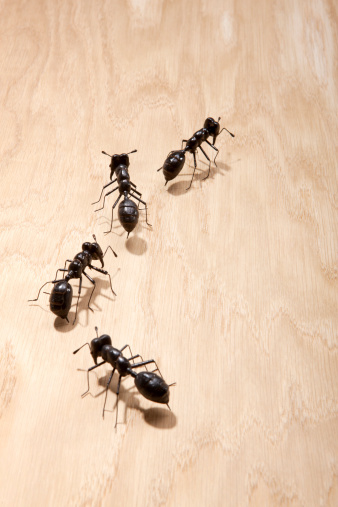 There are several reasons and probably a few ways that the ants are in your home. Ants tend to sent out scouts in order to find out where there might be food to eat and bring back to the colony. If a scout manages to find a crack or hole that leads into your home, it may find a crumb or two on your kitchen floor, or something else that leads it to bring other ants in. If they discover enough food particles to merit a continuous line of workers, that’s when you will see them marching from the entryway to your home to the kitchen and back again. Other things can be a precursor to ants discovering your home, such as a leaky hummingbird feeder or a spilled soft drink that never got cleaned up outside of your house. Ants may then decide to venture in further to see if they are rewarded again. They often are. Getting rid of the ants may mean taking care of the entire colony in some cases. In others it just means killing the ants inside of your home and then blocking off their entryways. However, in order to do either of these you will likely need professional help. These ants are very small, so finding out their entrances and exits inside and outside of your help will mean the need of expert eyes and knowledge. A trained exterminators will know precisely what to look for and how to help you solve the problem of these little black ants.